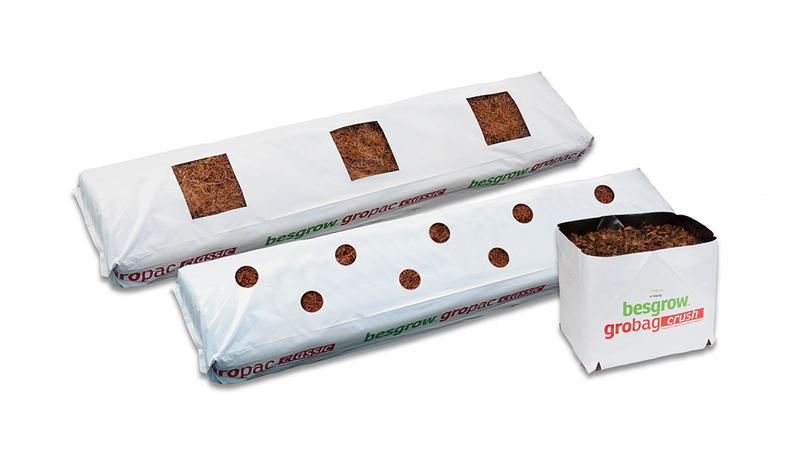 Besgrow Gropacs are purpose made, compressed slabs of coir wrapped in UV treated plastic. Gropacs comes in specific grades and sizes to suit the growing conditions of many hydroponic crops. We are able to pre-cut plant holes and drain slits to customer specifications. As well as this we are able to drill a small hole in the coir for your dripper. This makes installation of the Gropacs very quick and easy. Besgrow Coir is your only option when looking for a consistent, quality growing substrate for hydroponic growing. Many growers in New Zealand and Australia are using Besgrow Coir with excellent results. Specific grades have been produced to give the grower the options of various air and water ratios to suit their growing conditions and personal growing techniques. At the end of the growing season, because coir is an organic product, it can be recycled and used as an excellent soil conditioner. There are no disposal issues with coir as with some other hydroponic substrates. Besgrow supply a variety of Coir Gropac sizes to suit many growing requirements. With comprehensive quality systems in place during production, you can be assured of the consistency of every Gropac.